Q. Tell me about yourself. Who are you — and how did you get into this work? 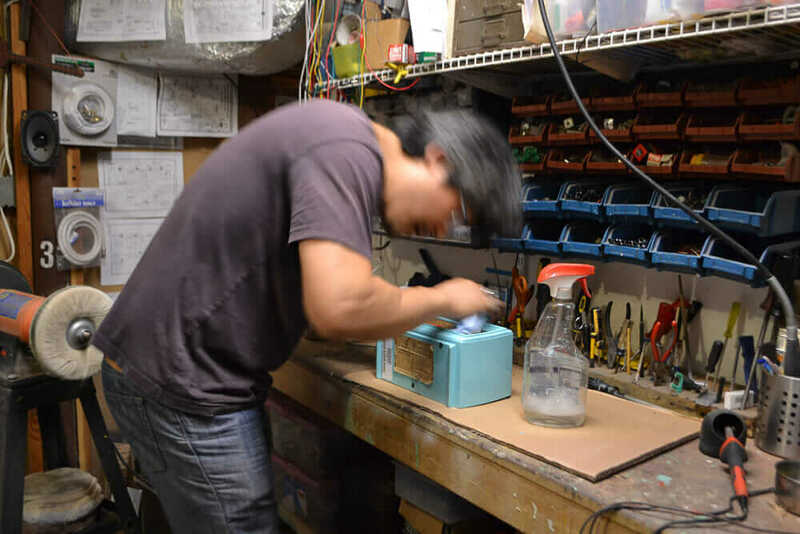 My name is Allen Chiang, and I started Retro Radio Farm out of my love of repairing and restoring vintage radios. It is my mission to raise the appreciation for these vintage radios. Many people already realize the iconic status of mid-century cars, art, and furniture, but vintage radios have yet to be discovered as valuable collectibles. Q. Can you tell us what you know about the allure of the radio back in the day? 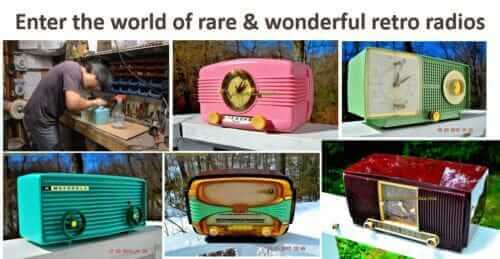 All those beautiful vintage radios! Why so much industrial design effort into this product? 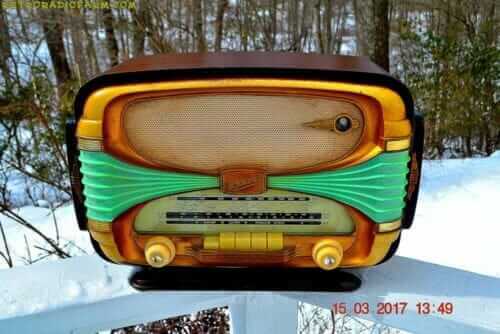 Nearly every household in the fifties had at least one radio. With so many manufacturers vying for such a large market, many interesting and some even curious designs were introduced. It was a time when the U.S. was recovering from war and prospering. With new found optimism and wealth comes freedom to experiment and take risks. 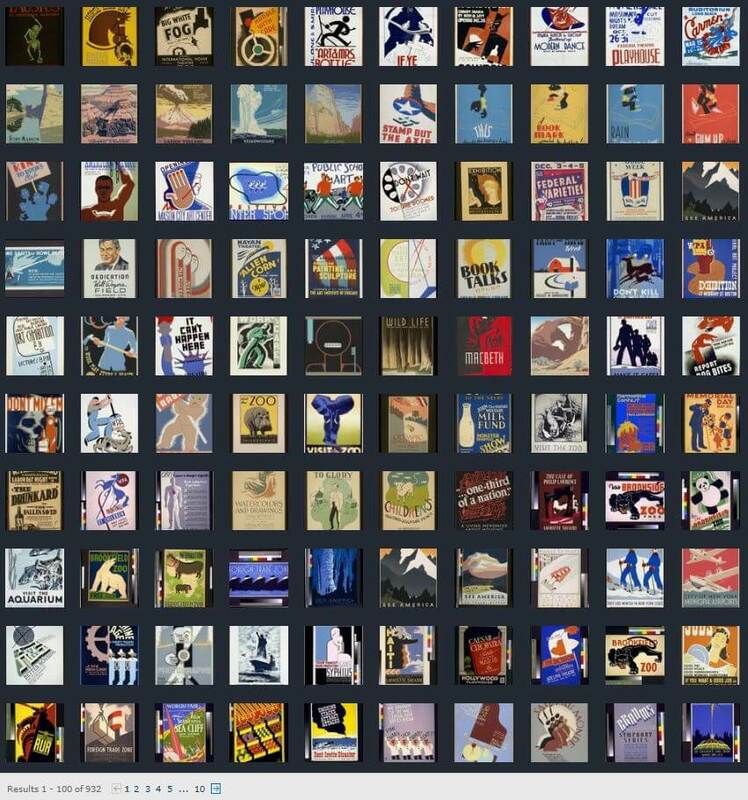 Some of the most memorable ideas in American art, technology, and culture trace back to this time. Radios are just one example where manufacturers were bending over backwards to appeal to consumers’ nascent sensibilities and disposable income. Dark wooden cathedral and tombstone radios from the 30s and 40s became associated with another time. 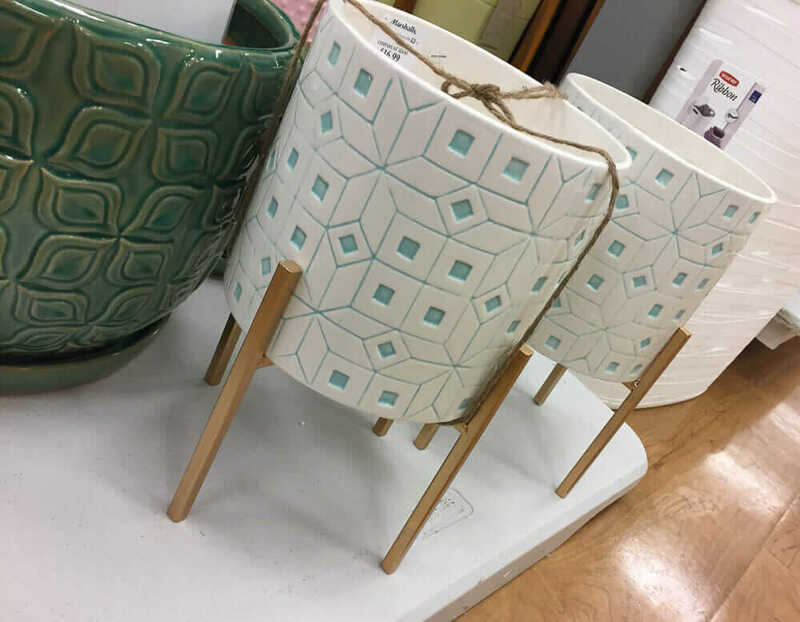 By the 50s, pinks, turquoises, seafoam greens with angular shapes, futuristic themes, became the new and rebellious norm. The ethos guiding these designs can be seen in cars, houses, kitchen appliances, practically everything from the period. Almost all American branded radios were manufactured on American soil. However by the 60’s, radios and consumer electronics became almost exclusively foreign. With outsourcing, unfortunately, it seemed radio designs became a little more sanitized and conservative. Many physical aesthetics of consumer electronics seemed to have survived unchallenged to this day; the brushed aluminum, hi-tech looking black surfaces, and the fake woodgrain. Q. What is the rarest radio you ever worked on (from the midcentury era)? Why was it so rare and/or desirable? I work on so many rare radios it’s hard pick the rarest. The 1951 Pink Lang is one of the rare ones. It was manufactured in Los Angeles, Calif. 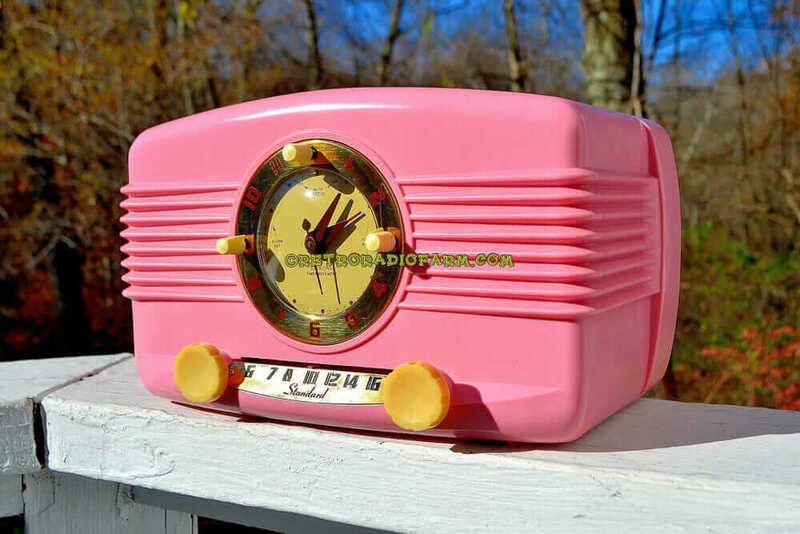 The pink color is an original factory molded color which is rare, and probably seemed unusual at the time, because browns and ivories were all the mainstay when this radio was made. Any New Old Stock (NOS) is rare by definition. This is an authentic vintage piece that is brand new, unsold, or parts inventory that has never been used. I’ve come across several NOS pieces in my time and they are hard to find. I have a 1957 Motorola 57R, a rare model in its own right, in desirable turquoise, that was assembled from a brand new cabinet. It came in an original Motorola box with all the original carton labels and packing material! Q. On the flip side, can you speculate on what was the single best-selling radio in the midcentury era? I don’t know the actual sales numbers of all manufacturers and models. But, I can say what I see most frequently. General Electric seems to nab this category. In the early 50’s, GE’s popular 500 series seems to be everywhere. 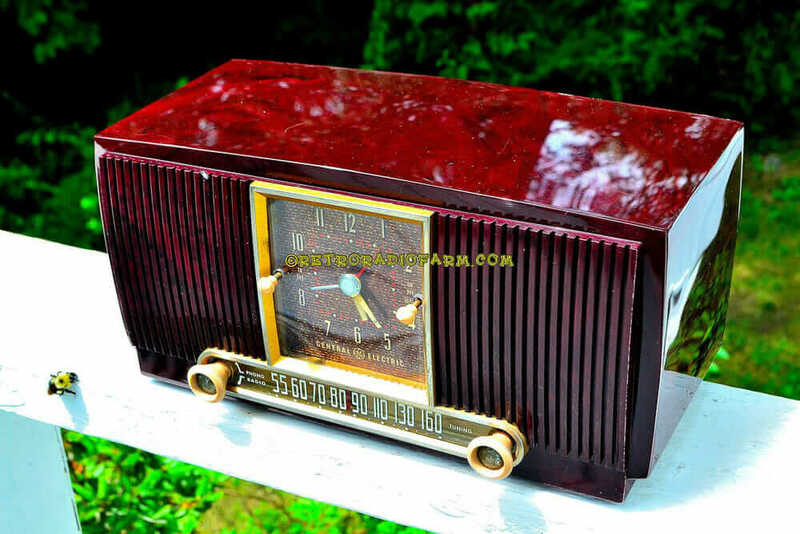 It’s your basic clock radio of the time available in marbled brownish burgundy color, red, brown or ivory. It is a metal chassis 5 tube staple that sounds pretty good and is made of quality construction metal chassis with point to point wiring. In the late 50s to mid 60s, GE once again tops my list. Again, a basic reliable clock radio but now based on mini 7-pin vacuum tubes and printed circuit board. It was available in ivory, blue, green, pink, and of course, brown. Q. And… what about ‘workhorse’ models? That is, are there any particular radios that just… never break down? Like other things in life, it seems you get what you pay for. This is no exception in the radio category. Crosley, Stewart Warner, Stromberg-Carlson stand out with superior design and quality of materials and manufacture. I’m sure there are many other manufacturers, boutique and niche, which may be as good or better. Some may consider RCA, Westinghouse, Zenith, and Motorola a notch above. It’s surprising that only Crosley and Motorola on this list are still around. Actually, Crosley is the only manufacturer on this list that is still in business today doing more or less what they were doing 50 years ago. Q. Some of the radios in your online shop right now sell for $179 — and some sell for $1,000 — or more? Why the difference in value? It should come as no surprise that rarity and condition are the key factors. The prices for these old radios is very subjective. Unlike vintage cars or some baseball cards, there isn’t much of a collector market for old radios yet. In other words, they’re all relatively inexpensive even for a fully restored and working one. These radios sold for approximately $40 when they were new, or about $400 in today’s dollars according to the U.S. Inflation Calculator. A restored working vintage radio today costs about $200, which is about half of what these radios cost brand new. Not even keeping pace with inflation. On the other hand, a 1951 Ford Custom had a MSRP of $1,705 or $16,500 in today’s dollars was recently priced at $26,500, which is more or less keeping pace with inflation. A Hemi Cuda or Shelby Mustang could sell for millions by comparison and thus far outpaces inflation. Q. What should Retro Renovation readers look for (brands/conditions/features/colors? 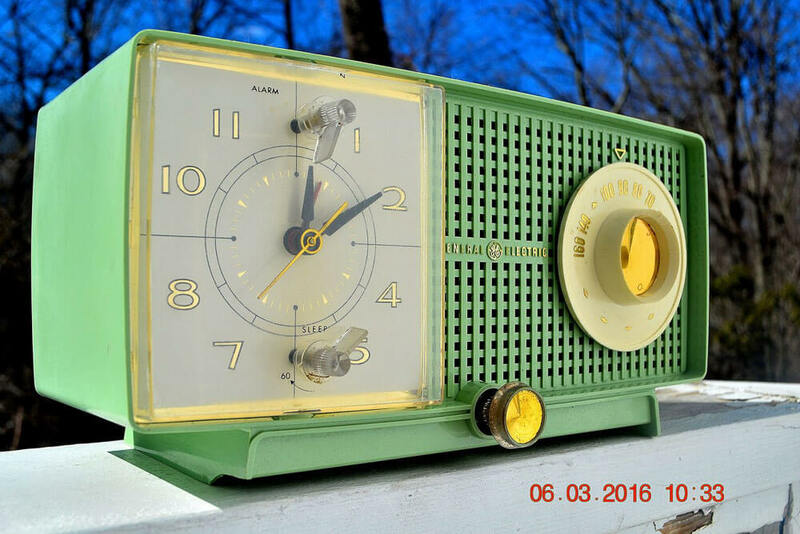 ), when they are out at estate sales and thrift shops, if they want to buy a vintage radio of their own and are looking to score a real treasure? Some pretty obvious advice again from my end. Go with your gut. If you like it, buy it. Radios have not yet been priced out of range yet by collectors. If it doesn’t work, and you spend a couple hundred dollars for an expert to fix it for you, you still have a deal. But, among choices, I would say condition is king. Many people, other than your die-hard radio collector, would rather have a not-as-rare radio in excellent condition than a rare radio that is cracked or missing parts. As with all old electronics, you should have a qualified expert repair the radio before you use it on a daily basis. Even if it still works, the electronics are nearly a half century old and will need servicing. Q. What radio do YOU listen to? For me, the thrill is in the process of trouble-shooting and diagnosing these muted relics. We have one radio that my family listens to. It’s a 1955 Oceanic Surcouf made in France. It’s unusual, other-worldly, and like many things French defies explanation, but has a way of endearing itself to all who come across it. My wife uses it the most when in the kitchen or working on our business. This is because I put in the Amazon Echo dot and so she can listen to the news, weather or her favorite podcast or music while working. Thank you, Allen, for all this great info. Now, I just need to figure out which radio I’m going to go for — and yes, I need to Bluetooth it for sure, as my family is all about their Spotify lists! Editor’s Note: Retro Radio Farm recently became an advertiser on the blog, and while that is how I heard of them, this story is NOT part of “the deal” for the ad. I did the story independently, out of interest in the company. For more on how I make a living on this blog, click here. 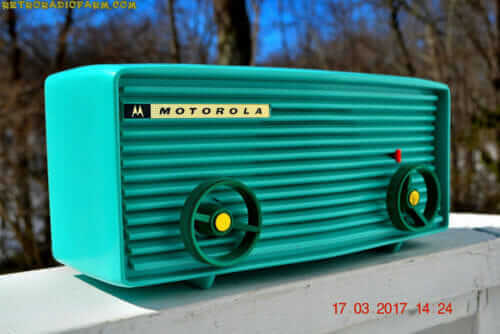 I wasn’t around midcentury (80s baby)- can someone tell me why most radios were AM only? Was FM just not a thing? I love these radios, but I’d actually like to use them and there’s almost nothing on AM I listen to. 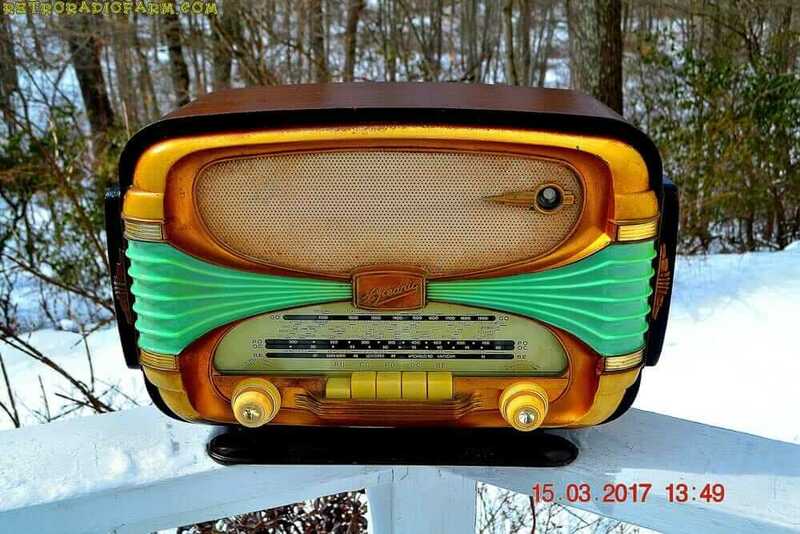 The radios are gorgeous! Natalie, FM was NOT a thing, ie, not common until the 1960s. Edwin H Armstrong started working on FM (frequency modulation) radio in 1928 and the first FM service, the Yankee Network was started in 1939. It required a separate receiver. I could be wrong, but I think most transistor radios back when I was a kid were AM/FM. At least that was touted as an advantage of particular radios. Another type of portable radio that was popular among some were the multiple band radios with shortwave and marine band, etc on them. You could pick up broadcasts from al over the world, including the high seas, on them My husband used to have one. Back in the day, it was popular to listen to broadcasts from far away. My dad liked to listen to St Louis Cards’ games and I liked to listen to WOWO- Ft Wayne, Indiana. Good Vibrations is the perfect song to listen to through a bunch of static! When I had my radio tuned up I had the technician install an input that allows me to connect my laptop or Bluetooth receiver to it. It works great I can play any genre of music on it now. It’s a large floor model 1940 Zenith so the big bands sound great. No mechanical modifications were done, just a hardwired input to an external source.